Honda audio interface and Bluetooth. 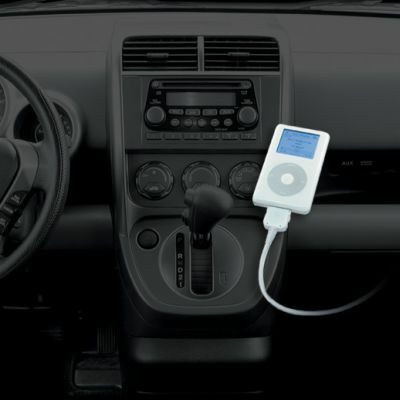 Connects iPod's audio output directly to Acura Honda Audio system for optimal sound quality playback. Displays text information on all Honda radios that are XM ready. Retains Honda Satellite radio receivers, CD-changer, and DVD systems. Offers three ways to access the music on iPod, namely Direct Mode, Folder Mode, and Playlist Mode. Charges iPod iPhone, and iTouch while playing. Charging stops at 30 minutes after car key is turned off to prevent car battery drain. 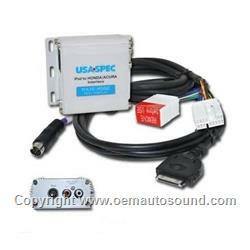 Connects and lets you listen to a 2nd audio device Satellite radio, DVD player , or other audio source to the car audio system through the AUX audio input jack. it lets you use direct mode to listen to music from Pandora or XM Sirius online. Album name & Song title display on XM ready Honda radios This new interface will be packaged with the iPod cable which will charge iPhone 3G, 4G iPod touch (2nd G), iPod nano (4th G) and all other previous generation iPod, Nano, Touch & i[hone. Full iPod controls from Honda XM radio controls. Displays text from iPod No conflict with sat tuner. Backward compatible for all older Honda without Sat. Comes standard with new USB 5 volt charging cable. Compatible with all iPod's will also charge iPhone 4G iPod touch iPod nano 4th gen.